President Trump displays an executive order after he announced the U.S. would recognize Jerusalem as the capital of Israel, at the White House, Dec. 6, 2017. Chinese state media predict a sweeping backlash to President Donald Trump's decision to recognize Jerusalem as Israel's capital in what is being characterized in Beijing as a risky and unwise decision. Some editorials even warn the decision could lead to more terrorist attacks on U.S. soil, hurt the American economy and fray relations between Washington and its allies in the Middle East. The story was a lead item on state broadcaster CCTV throughout the day as lengthy reports highlighted Palestinian objection to the move and how few support the decision, including U.S. allies in Europe. Reports also highlighted the instability and uncertainty the decision is expected to bring to the Middle East. A map of Israel and the West Bank showing boundaries of Jerusalem and the location of the US Consulate. The editorial said that through the decision Trump has proven that he is a “daring president” but noted that that also raises questions about what the president might do next. “The suspense carries weight. It seems that he will decidedly apply the power of the U.S. and forcefully reform those places in the world that dissatisfy him,” the article said. The article said such places could include North Korea. “If Pyongyang refuses to stop its nuclear and missile tests, the possibility of Trump resorting to armed force is higher,” it said. An opinion piece in the overseas edition of the Communist Party backed People’s Daily warned the decision could have an impact on U.S. ties with the Arab world and turn the Organization of Islamic Cooperation into a “cooperation” only in name. “Trump’s decision will increase contention between Israel and the Arab world and further strain relations between Saudi Arabia and Israel,” the piece said, adding that it could spark another wave of anti-Jewish, Israeli and American sentiment among religious extremist groups and nationalists. On social media, the warnings and concern about risks were even more intense and varied. Some argued that Trump’s decision was dangerous and destined to only re-ignite tensions in the Middle East and Jerusalem. One user on Weibo said the decision was like lighting a match next to a powder keg, another that it had opened the “Gates of Hell” in the Middle East. Some wondered whether there was a connection between the decision and Trump's tax plan. Others asked that with the U.S. already busy with North Korea, how could it handle trouble with the Middle East too. Some agreed with the Trump administration’s position that after so many years of doing the same thing it was time to try something new. “Be it North Korea or the Middle East, Trump’s logic is correct,” one user wrote. Another user called Trump a courageous leader who dares to speak the truth, suggesting that the move had opened up a "New Era for peace in the Middle East." That user added, however, that the world was counting on Israel to make sure that happens. While there has been widespread criticism of Trump’s decision, some analysts have argued the move could prod Israel to make concessions to the Palestinians. 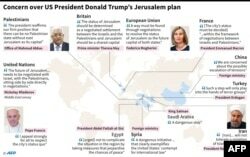 In the past, U.S. presidents left the status of Jerusalem – which is home to sites holy to the Jewish, Muslim and Christian religions – to be decided in negotiations between the two sides. For its part, the Chinese government has voiced its concern about the possible escalation of conflict in the Middle East and its support for a peaceful resolution of the dispute. At a regular press briefing on Thursday, Foreign Ministry spokesman Geng Shuang said China would continue to support the Middle East peace process, calling for an early resumption of talks. Geng also re-iterated China's support for the Palestinian people to establish an independent state that enjoys full sovereignty based on the 1967 borders with East Jerusalem as its capital.